Soak 2 cups of organic canellini beans overnight, then cook and drain them. In the pot the beans were cooked in, layer some cleaned fresh spinach on the bottom and then put the hot beans on top of it to wilt it. Mix up a little olive oil, a lot of crushed garlic and juice of a lemon and pour it over the hot beans and spinach with salt and pepper. Add the fresh herbs, mixed it up and let it cool. 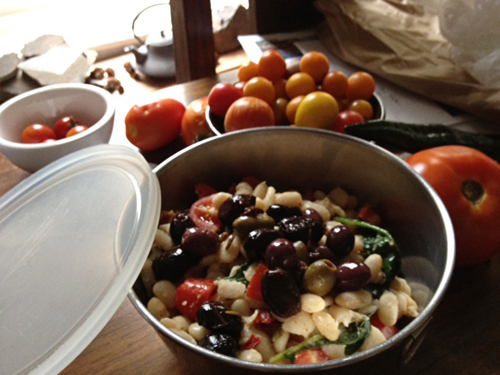 When room temp, add chopped fresh tomato, a few sundried tomatoes and kalamata olives. Maybe we could get some the next time we go in. I guess we better bring the herbs! As the Brooklyn recipient of this delicious & beautiful salad, I can say that it was a wonderful taste of summer, with the addition of sliced heirloom tomatoes drizzled with olive oil, and crusty Italian bread, served in the wilds of our very unmanicured back yard! Sounds delicious… and soon you will see how equally wild things are around here. The herbs are plentiful, but if only those weeds could be basil plants instead!